What is almost immediately noticeable when you drive past the pristine Pawna lake, is how nature in this part of the western ghats springs to life. A variety of bird sounds welcomed us when we arrived at the luxurious all Villa, Hilton Shillim Estate Retreat and Spa. The check-in formalities were completed while we were comfortably seated in a verandah at the Retreat Gate House, with open views of a vast expanse of lush green hilly terrain. Abhishek, the charming young butler appointed to assist us during our stay, walked us to a waiting Nano, one of 25 at Hilton Shillim, used to ferry guests across the vast property. As we drove up a winding path, along a steep hill, surrounded by unspoilt forest landscape, Abhishek explained that the owners of the hotel, the DeSouza family, had been acquiring land in the Maval area over decades, and had over time amassed 3500 acres of which a generous 340 acres have been allocated to house the very luxurious spa and retreat. 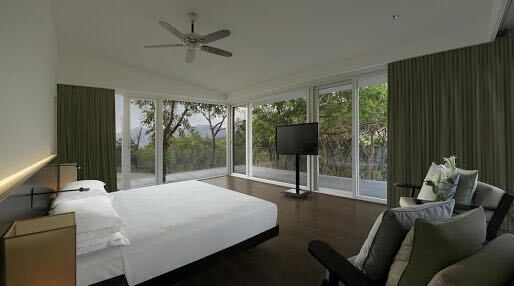 He said that the philosophy at Shillim was to conserve, sustain, heal and enjoy and that we would during our stay, understand how important these watchwords were to the staff at the resort.At the top of the hill, with panoramic views of the Western Ghats and the valley below, was our Presidential Villa # 601. The doors of our 3-bedroom, 550 sqm villa opened up to a large living room with glass doors overlooking a temperature controlled private pool and a well-manicured garden. The villa had a private deck where I planned to sip my evening glass of cabernet while posting our holiday pictures on various social media platforms. While we were settling in, Abhishek explained that no trees were felled while constructing Shillim and that additional trees and shrubs were in fact planted in an effort to increase the local bird species and offer nature a helping hand. 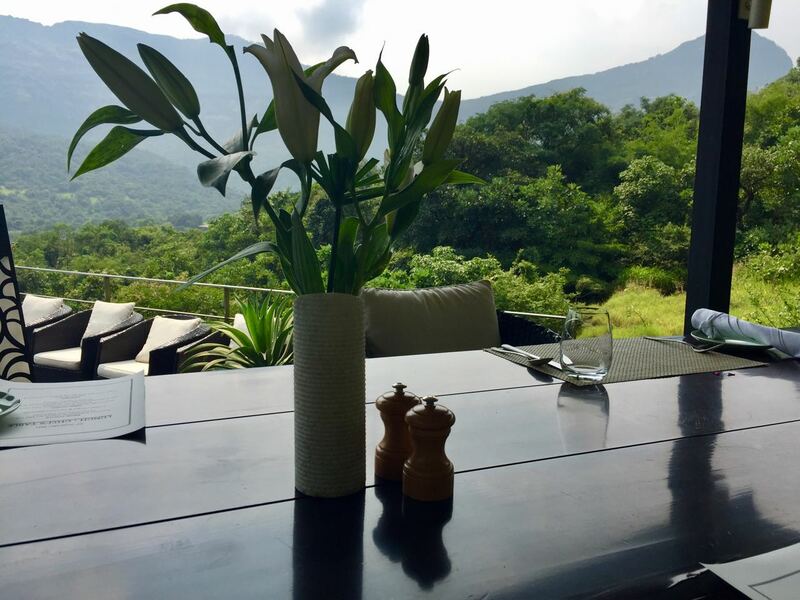 After a quick tour of the room, we were told that an exclusive lunch was ready to be served to us at the Chef’s Table, a very private outdoor venue, situated on the banks of a stunning seasonal waterfall, with awe-inspiring views of the Western Ghats. We were introduced to Executive Chef Shubhendu Kadam who had personally crafted the menu for our afternoon feast. We started off with a Mezze Platter of Hummus, Babaganush, Labneh Binz Zayt and Muhammara with a Pita Pocket. This was served to us with a Pumpkin Ginger and Coconut Cappuccino. 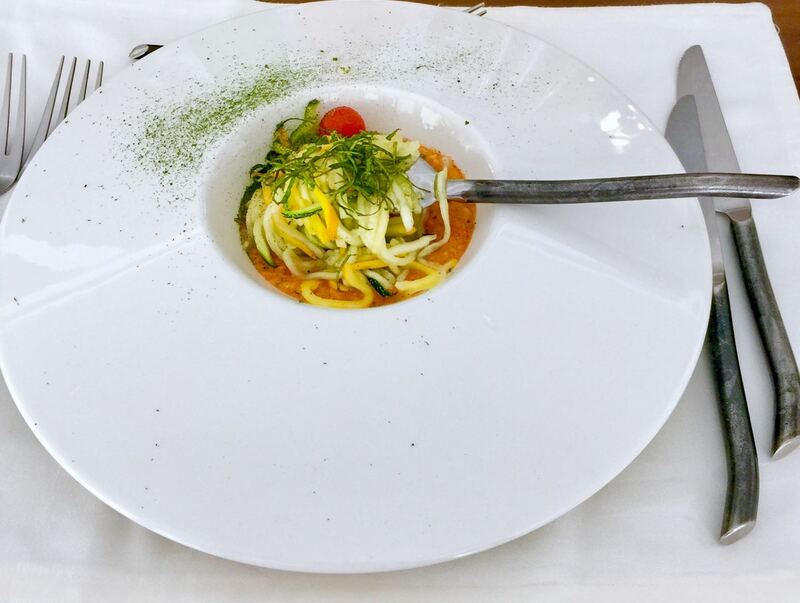 In the Main Course, Shubhendu served us a homemade Whole Wheat Lasagne, with chia seeds and Pesto Ala Genovese. The plating of the dishes was a reflection of the passion and skills of the talented young Chef and his team. The lasagne was served to us with a delicious Braised Chicken Breast, Black Sesame Seeds and Roasted Organic Greens. Not only could we taste the freshness of the flavourful vegetables and herbs, plucked from the organic farm garden at the hotel, but we also enjoyed the bright clean colours of the wholesome vegetables and local produce which was our first meal of our stay. We finished off the feast with a Yoghurt Mousse, Fresh Fruit Tart and an Apricot and Prunes Dumpling. I am more of a chocolate dessert lover and felt that the dessert lacked the punch I usually look for in my after-meal sweet treat. We returned to our grand villa to rest after a truly enjoyable meal. At 1700 hours we had a private wellness consultation scheduled with Dr. Arun Pillai at the Consultation Lounge at the Spa Zone. Dr. Arun is a widely travelled, experienced and an affable man of immense knowledge. He sat us down and explained the programmes available at Shillim which could be a quick 3 or 5-day treatment or the longer 1-week, 2-week or 4-week programme. Dr Arun said that the aim of the programme was to have a special goal oriented package curated for the individual by a team of experts which would include Naturopathy and Ayurveda treatments, Yoga, a Fitness routine and most importantly, a carefully thought out nutritional menu, tailor-made for an individual based on extensive discussions with highly skilled and qualified wellness masters. He said that in order to present the visitor with a holistic approach to the spirit of well being, there is a core emphasis on meals for which dietary intolerances and allergies would be recorded and preferences would be considered. Shillim does not recommend calorie counting diets but encourages guests to adopt a more balanced approach to their food, which Dr. insisted, must be enjoyed. He added that spa therapies would be recommended based on the selected programme and length of stay. Meditation would also be an important part of the overall programme as would activities such as nature walks and treks. After an hour-long conversation with Dr. Arun, we walked to the tea house where an elaborate tea ceremony had been planned for us. We were asked to remove our shoes before we entered the peace and tranquil relaxation area where the air temperature was evenly cool. 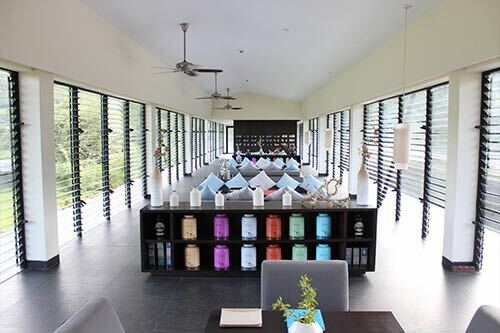 I was surprised to learn that the air at the Tea House was not controlled by a machine, but in fact was natural mountain air, let in from the glass louvres which made up the windows at the Tea House and were also the source of the plentiful natural light. We were comfortably seated down as the ceremony began. 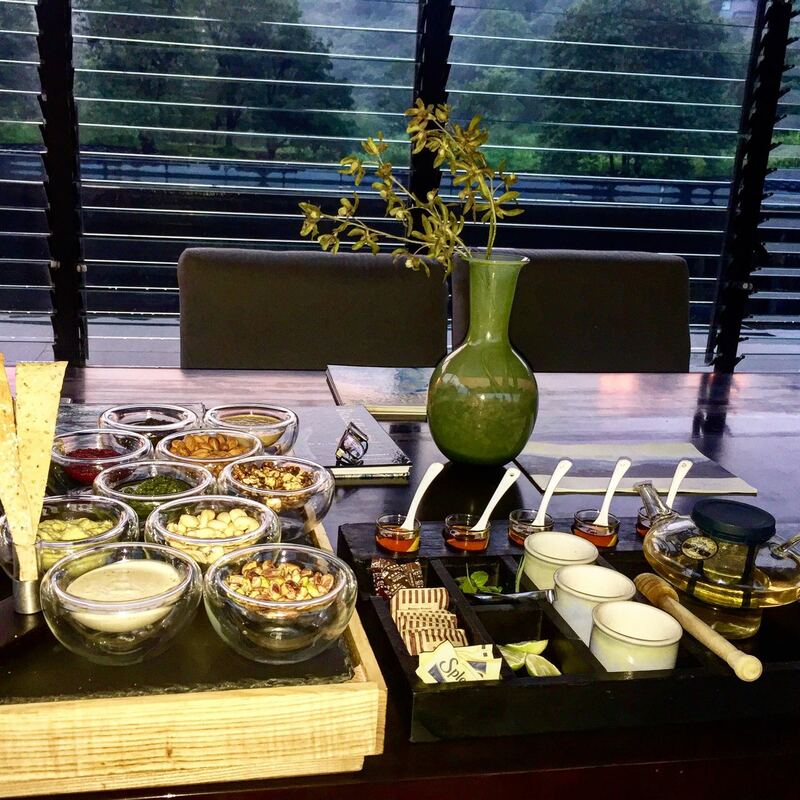 As a choice of regal house blends of floral and herbal infusions were being prepared by Jayanta, we were first served a tray of Lavash with 6 dips and 4 bowls of dry fruits and nuts. Chef Shubhendu and Dr. Arun joined us for the ceremony and educated us on the benefits of the variety of natural and organic teas on offer. When the fragrant teas were served, I was tempted to capture it all to share with my readers and what a fine ceremonial picture it made, a clean and pure reflection, even though in tiny parts, of the elaborate ‘Chado’ tea ceremony of Japan. In Japan, Chado is almost considered to be sacred, a classical art of refinement. And in Shillim, both Laveena and I felt a similar sense of satisfaction from what almost seemed to us like a sacred and refined art form, something which every guest at Shillim must experience. We returned to our room and enjoyed an evening swim in our villa pool, overlooking the majestic Sahyadris. As the mist languorously wound its way past the green hilly foliage, Laveena and I enjoyed spectacular views from our heated pool. It felt therapeutic, warm and comforting to be submerged in this aquatic blanket, given the ample mist and the fast falling mountain temperatures. 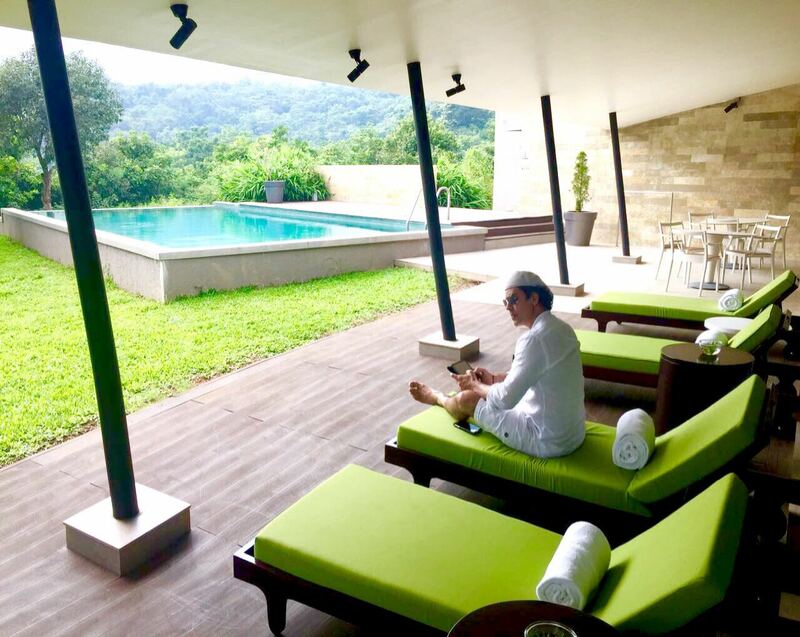 We wanted this moment to last forever but we had plans to meet Amandeep Grover, Director of Operations at Hilton Shillim Estate Retreat and Spa, at the Valley Bar for a drink. 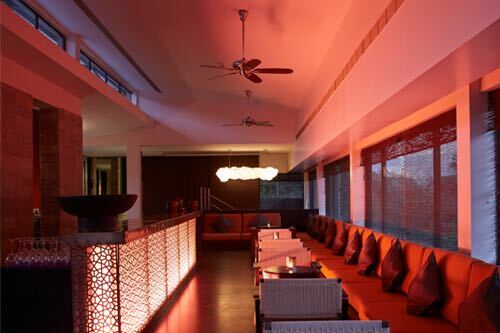 The Valley Bar overlooks the vast expanse of the valley and is an ideal place to begin your evening at Shillim. We had a choice of settling down for a drink indoors or soaking up the ambience outside and we obviously chose to sit outdoors given the cool evening weather. Unfortunately, the beautiful mist got denser and made it difficult to see our palm in front of our faces and we had to return indoors where a table for four was set up for us. Along with our selection of exotic cocktails for the evening we were served mini pizzas (gluten-free for Laveena of course), marinated olives and assorted canapés. Our time with the more than charming young Aman was very well spent as we engrossed ourselves in conversations about life, travel, our love for luxury experiences and the fast-changing hospitality industry. 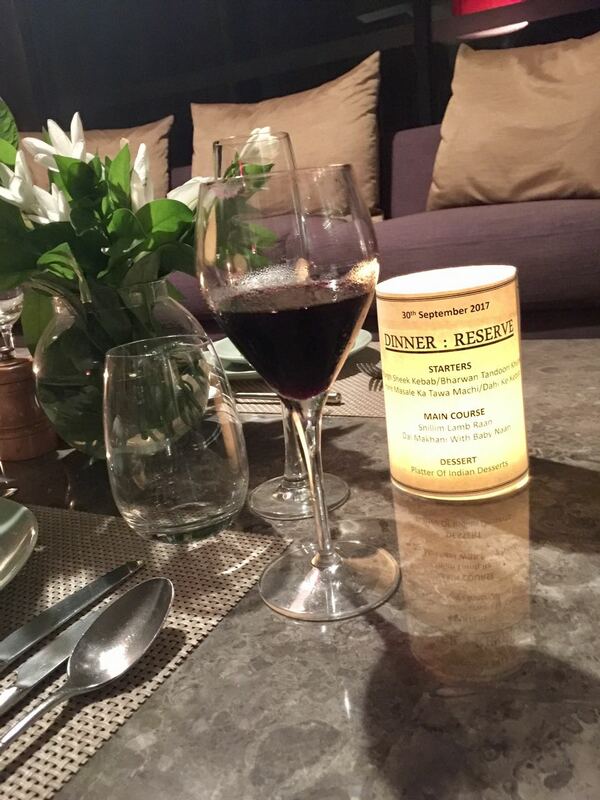 Dinner was at The Reserve, the elaborately stocked wine cellar at Hilton Shillim. We were surprised to see that our table for two was a private setting in the cellar with no other guest from the hotel present. It made us feel extra special and from the extensive selection of wines, I settled on the Indian York Arros, a 2015 vintage, recommended by our server for the evening, the very jaunty and gleeful young Shovan. The nose of the wine was distinct with hints of nutmeg, blackcurrant and tobacco. Aged in French and American Oak barrels, the finesse was even and the chalky tannins and burst of caramel and dark chocolate made for an ideal companion to our menu for the evening which included a delicious spread of Murgh Sheekh Kebab, Tawa Machi and tender Shillim Lamb Raan with Dal Makhani and Baby Naan. We returned to our villa and walked out into our garden where we were welcomed by an insect chorus of tree crickets and false leaf Katydids. 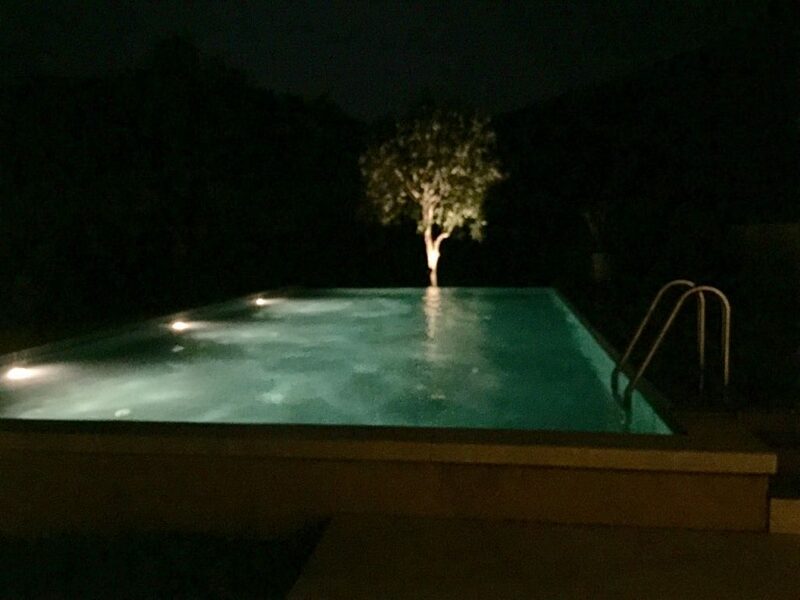 We could see the silhouette of the hills and the grassy plateau that lay beyond the valley and we both felt the time was perfect to yet again dip into our very private heated pool. We slept very well that evening and looked forward to our sunrise yoga and meditation session early in the morning with Manju. Wearing the lose white garb provided by the hotel, we made our way to the yoga pavilion and engaged in an enjoyable session of mystic yoga. From where we were we had captivating views of the Sahyadris. 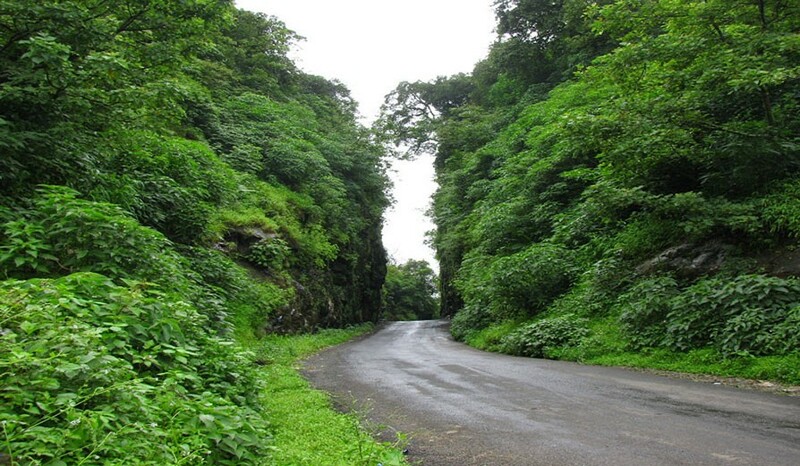 The Sahyadris are a mountain range which stretch from near the border of Gujarat and Maharashtra, South of the Tapti river and run approximately 1,600 km (990 mi) through the states of Maharashtra, Goa, Karnataka, Kerala and Tamil Nadu. They end near Kanyakumari, at the southern-most tip of India. The Sahyadris are home to 7,402 species of flowering plants, 1,814 species of non-flowering plants, 139 mammal species, 508 bird species, 179 amphibian species, 6,000 insects species and 290 freshwater fish species. After our enjoyable hour-long session of yoga and meditation, we were hungry and were excited about the healthy breakfast treat planned for us at the Green Table located in the Quiet Zone an area where children below the age of 12 are not allowed. My plate had four little baskets on it. I was told that each basket made from whole grains, contained within them a combination of nutritional dried fruits, nuts and seeds. 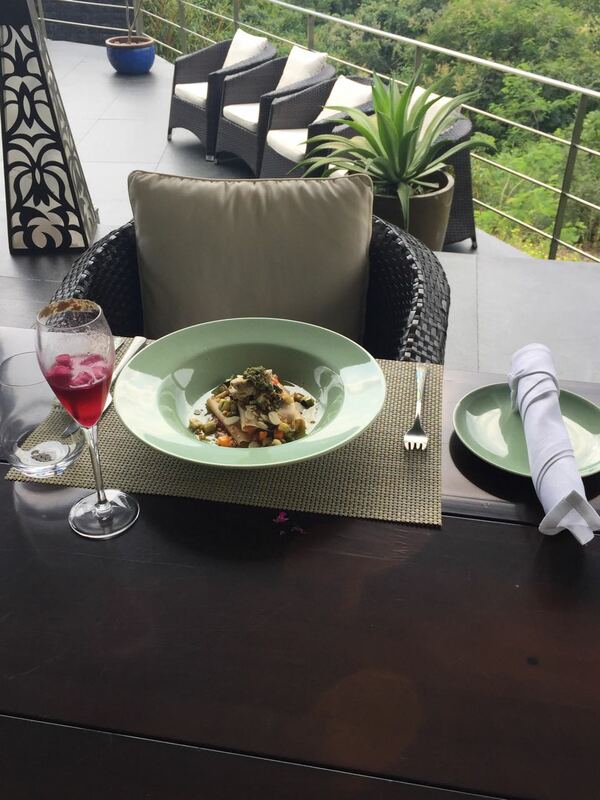 Chef Shubhendhu described them as ‘super-foods’ and said that everything on our plates was organic with ingredients chiefly grown in the resort gardens or sources from one of many local farmers in the surrounding areas. I was asked to pour some fresh almond milk over each flavour filled bite, which I did and I have to say I thoroughly enjoyed, as did Laveena. A very special part of our stay was spent at the Spa Zone which houses a number of therapy suites. We were appointed two highly skilled massage therapists, Naonglepla and Athela who made our Sahyadri Signature treatment forever memorable. We emerged from the experience feeling rejuvenated and full of vitality and vigour which was just the energy we needed for our afternoon session at the Shillim Cooking School with Chef Shubendhu. Although Laveena and I think of ourselves as food enthusiasts, neither of us spend time in our kitchen at home. So when offered an opportunity to try our hand at cooking in a relaxed interactive environment, we were understandably excited. 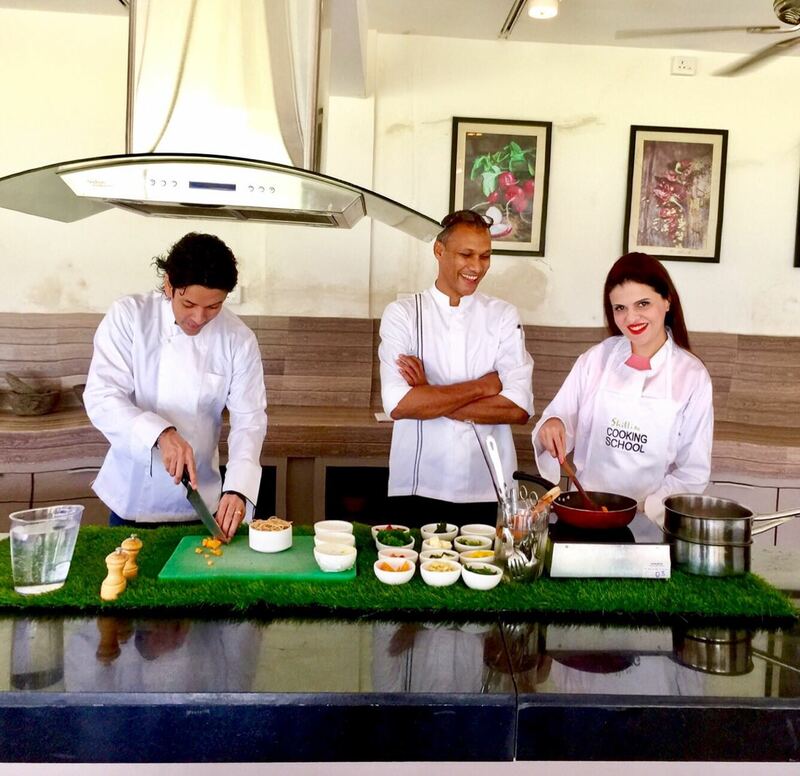 In our Chef whites, we marched to the Shillim organic farm, where we hand-picked fresh produce for our afternoon lunch. On the menu was a healthy soup of broccoli, basil, garlic and walnuts, a raw zucchini pasta with tomatoes, basil and garlic and for dessert there was raw cocoa, avocado, walnuts and forest honey mousse. Going back to school for us was an enjoyable lesson as we sharpened our skills of cutting, chopping, blending, shredding and mixing and finally created dishes which not only looked beautiful but also tasted delicious. At Hilton Shillim, there are a wide array of holistic, customised and engaging programmes on offer which help make this wellness experience, relaxed, purposeful and pleasurable. Early evening, we had a pottery session scheduled with Ms. Tejaswini at the Shillim Institute. We were given aprons and asked to sit by the potters wheel at the pottery studio. 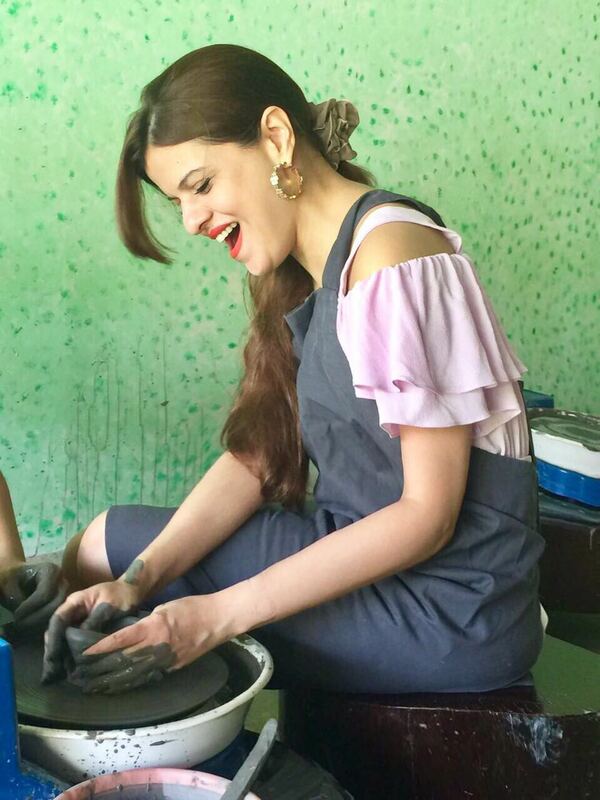 As we placed our wet hands on the slowly spinning clay, the sensory experiences we encountered while trying to mould the wet, cold clay, were ever so thrilling. We centred, poked, pinched, twisted, patted, rolled and finally shaped a bowl and a mug which were left out to dry. What was exciting for us was that the cold wet clay was highly responsive to touch and was also very forgiving. As we moulded and shaped our mug and bowl, we realised that the final shape was left entirely up to our imagination. We were allowed to express ourselves with our wet hands and fingers. It was okay to make mistakes as these were repaired easily with the help of the expert potter, Tejaswini, who at the end said that our artistic clay creations needed to be dried, glazed, fired up in the oven after which she promised they would be couriered to our home. 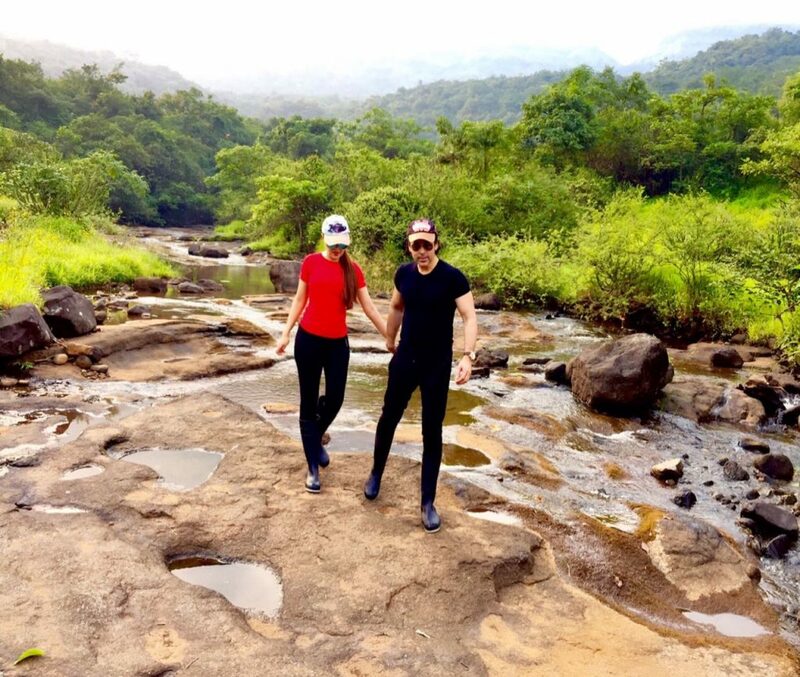 There is so much to do at this fabulous retreat and it is indeed hard to imagine that the Hilton Shillim is such a short distance from our home. Later in the day, we had a Shillim Stream Walk planned for us. We were asked to change into tall gumboots which added to the excitement of our water trek adventure. We met with our guide Mayur, who led the way through the tall mountain grass along a narrow man-made pathway, past cacti and shrubs, crab holes and ant hills and dry deciduous and moist deciduous plants. After a short walk we arrived at the flowing stream and were told that the pressure during the peak of the monsoons was quite intense. Laveena and I stepped into the gently flowing cold water and followed our guide upstream. We were careful when we stepped onto mossy and loose rocks as they were slippery and unstable. Surrounded by the high western ghats on one side and tall grass on the banks of the stream on the other, we continue to wade through the water as our guide Mayur, shared with us the ample knowledge he had about the region, its wild animals and the richness and diversity of the local flora and fauna. 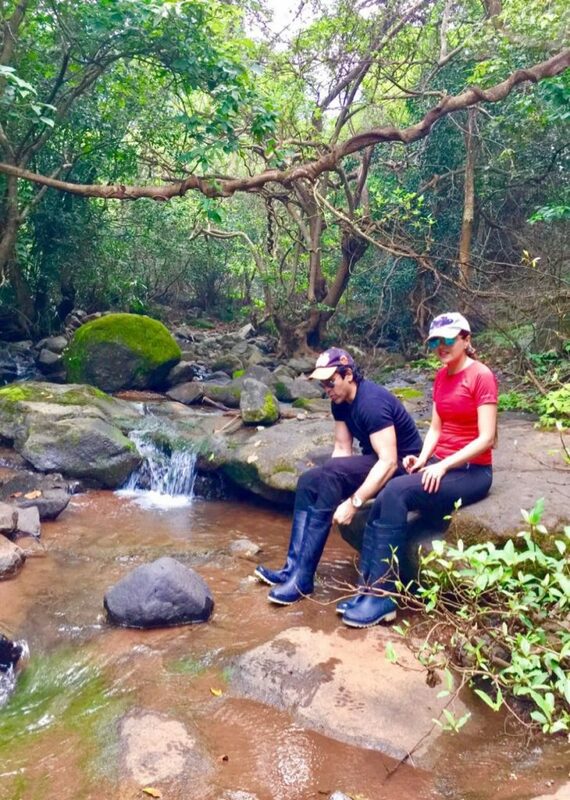 We stopped to rest on a rock and to empty our gumboots of the stream water which had flowed in when we accidentally stepped into parts of the stream which was knee deep. We even encountered an elderly couple from the nearby village who had come to forage in the wilderness for medicinal herbs. These they collected and sold in the markets to those who believed in the magic healing powers of nature. We were scheduled to check out the next day post a late lunch. After spending the morning at our villa, we treated ourselves to a Gemology facial at the couples therapy suite. After a gentle massage, a cooling mask was applied onto our faces. Once this was peeled off, our therapists, used smoothened pink quartz and white quartz stones to further massage our exfoliated skin. And then a light pressure was yet again applied across key but sensitive points on our face to rejuvenate the facial muscles and nerves. Repaired and as good as new, lunch for us was scheduled at the Mountain Bar and Bistro. The ambience at the bar and bistro is casual and relaxed as guests access the main retreat pool from here. We were served a delicious fresh juice with our lunch which for Laveena was a gluten-free pizza and for me a calzone stuffed with chicken, mushrooms, mozzarella cheese, basted with garlic butter and sprinkled with parmesan. In this unspoilt natural slice of mountain paradise, the calzone was the one dietary cheat I treated myself to. And I have to say it was absolutely divine as was Laveena’s crispy pizza. The Hilton Shillim Retreat and Spa scores a full 10 travelmango stars on innumerable fronts including luxury, service, comfort, location, experience and fun. But the one aspect which sets this retreat above the competition is the high-quality spa and wellness programme it runs. If you haven’t yet visited, you’re missing out. The pictures look lovely. Thank you for sharing all that the property has to offer as well as your personal experience of it. That’s a beautiful write up. The property is beautiful. Seems you had fun at the property and also in cooking sessions. Loved the whole experience. Photographs are magnetic! Thank you so much Nidhi. It was a great trip. Wow, you guys were completely in the lap of nature. Hilton Shillim sounds a great deal. The surroundings were pristine and the spa sounded dreamy. Wow,the place is looking like heaven. How was your cooking session there.. ? Love the way you have put all the information..
We had a great time, trying our hands on these exotic dishes. What an exotic location! Thanks much for sharing your experience. Love how you have described the place in your article. Love the piece! 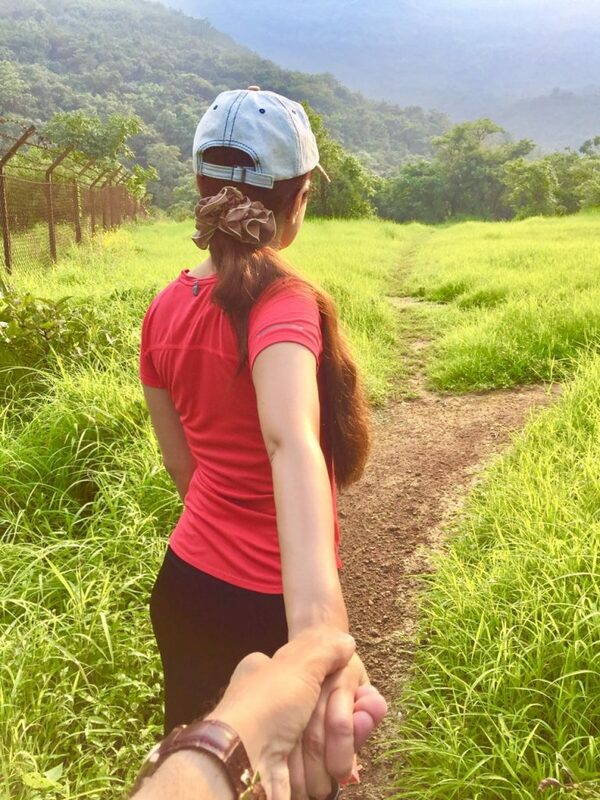 It’s a great treat for one to be in nature’s arms, especially at Shillim. This sounds so damn fun, I would love to pay a visit to Hilton Shillim for sure, thank you for sharing this amazing bit, would definitely plan a trip here with family. 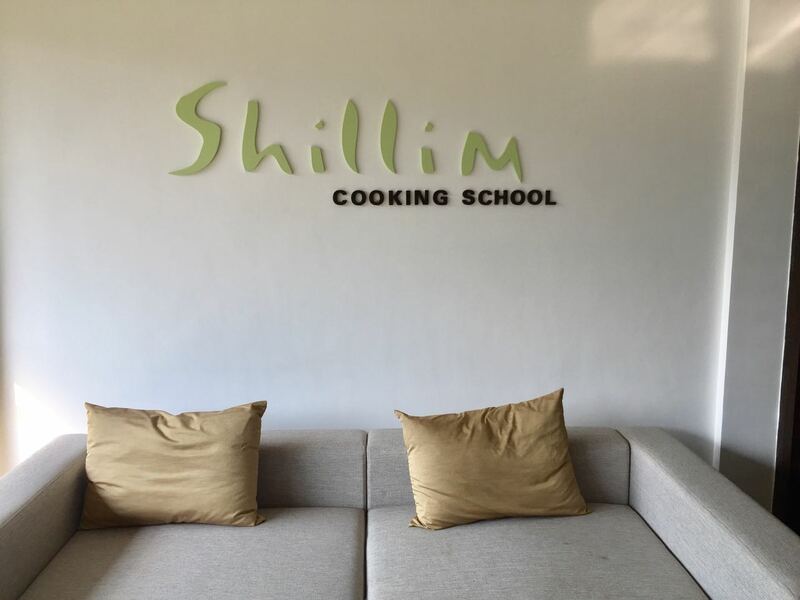 This place is extremely fun and mesmerizing, you should plan a trip to Shillim. Thanks for sharing this with me, I just loved your pictures. This place looks really good and property is luxurious . Never knew that there is such a beautiful paradise so close to Mumbai. Its definitely a relief from the hustle & bustle of the noisy city life. 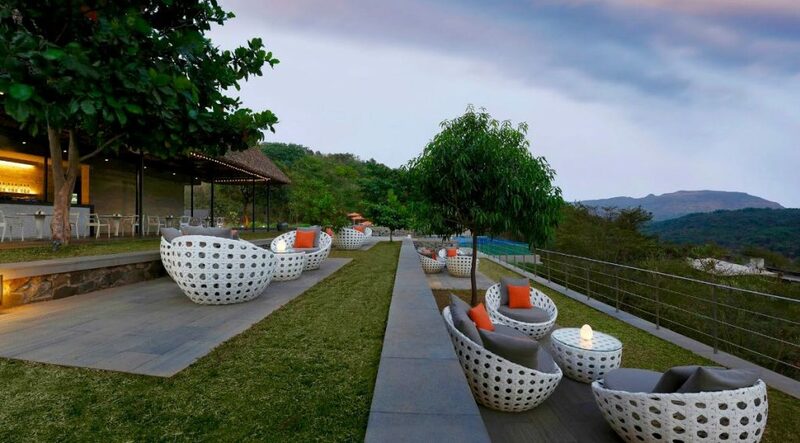 Nothing feels better than staying at Shillim, for a quick trip from Mumbai.